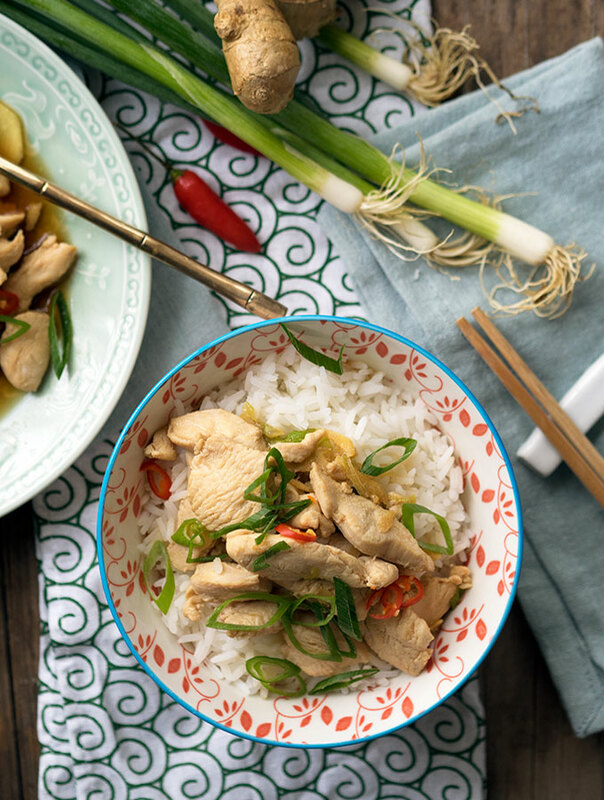 Home » Drunken Chicken, your easy dinner solution. 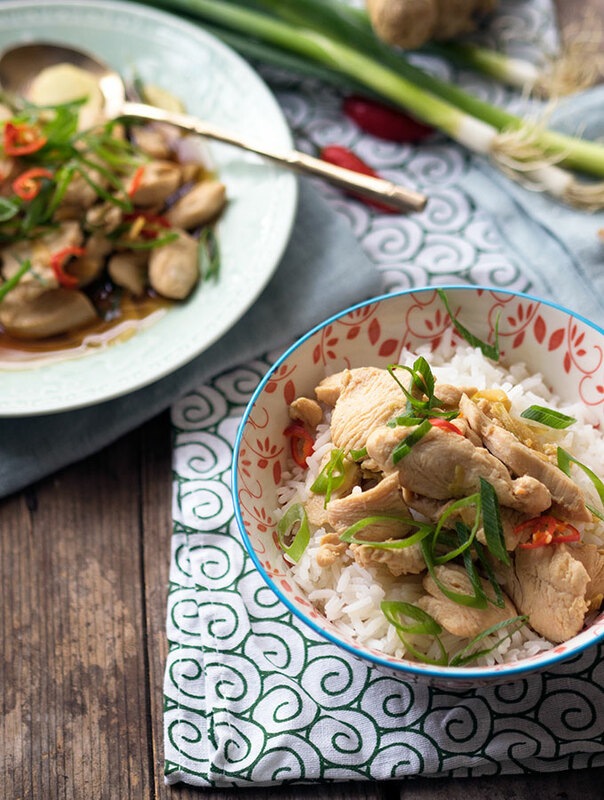 Drunken Chicken, your easy dinner solution. This is a take on a traditional drunken chicken recipe where whole chicken breasts are marinated over night. In this instance I am using chicken strips, which are perfect for a quick marinade and quick cooking. We like things quick and tasty around here. I am sure you do too. For me this dish makes a perfect Sunday night dinner. It’s a simple case of throwing the ingredients together to leave it to marinate, and then a very easy cooking process. Perfect way to end a lazy weekend. 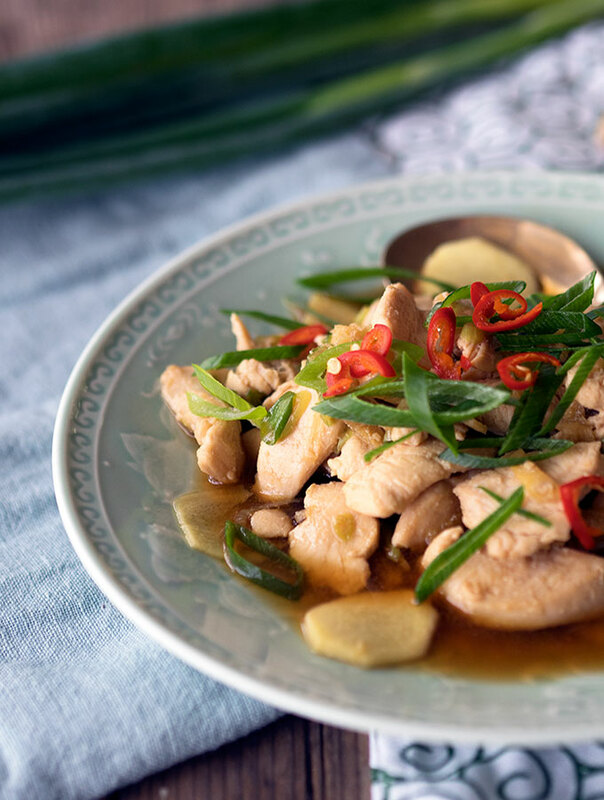 Drunken chicken is packed with flavour and I find it quite comforting. It’s a simple feel good dish. The drunken chicken recipe I have provided is for two, but if you add a little more chicken and make a side of steamed Asian vegetables you could stretch it to feed a family of four. If making it on a weeknight, get the chicken in the marinade when you walk in the door from work. Then do what you have to, there’s always a long list if you are like me. Make sure to leave it for a minimum of one hour, better if it is two, but on a weeknight we rarely have that luxury. One hour will still give you a very tasty result. 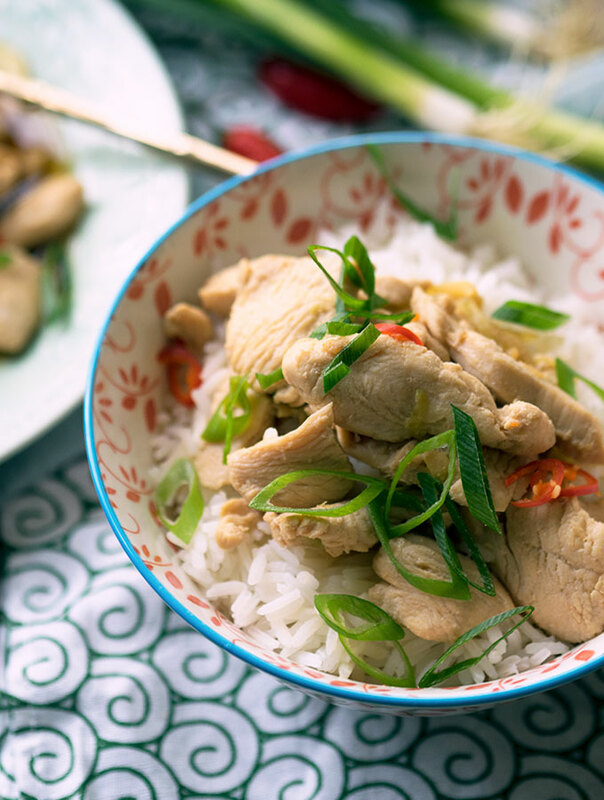 Drunken chicken is simple to prepare, and quick to cook. Simple flavours make this dish quite comforting. In a medium ceramic or plastic bowl place cooking wine, ginger, soy sauce and sugar. Give it a stir and then add the chicken breast strips, coat well. Leave chicken to marinade in the fridge for at least 2 hours, even better if left over night. 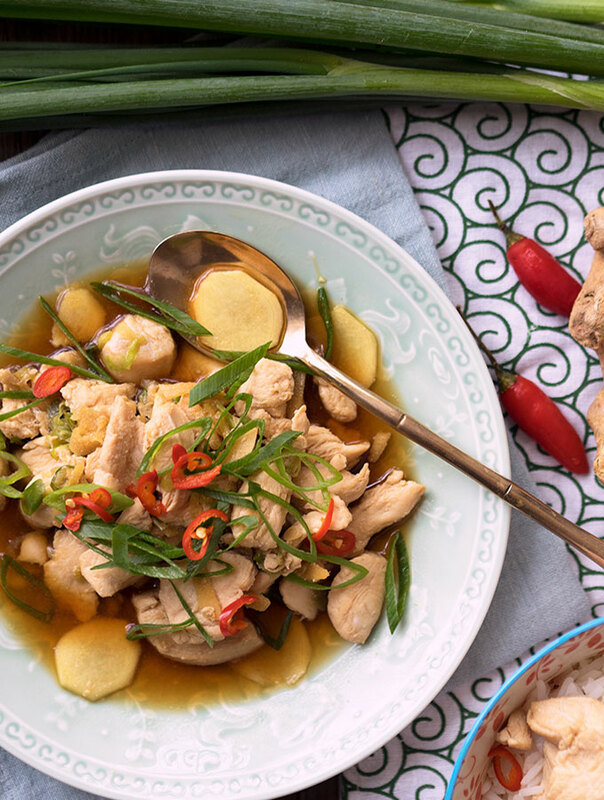 When ready to cook, strain chicken and ginger from the marinade. Reserve the marinade! Place reserved marinade in a small saucepan. In a wok or pan, place 1 tablespoon of vegetable oil. Over a low heat cook the chicken until cooked through. You don’t want to brown the chicken, cook slowly to keep it tender. The chicken should look pale in appearance. While cooking the chicken, heat saucepan with the marinade on the stovetop. Bring the sauce to a rapid boil and remove from the heat. Strain the sauce. The chicken juices, that have leached whilst marinating will coagulate on cooking, and not look very pretty, you want to remove that from your sauce. Place chicken on a serving dish and cover with the strained sauce. Feel free to garnish with some spring onion (green onion) and finely sliced chilli. Serve immediately with steamed rice. I have also made this drunken chicken and made sandwiches/rolls. Using crunchy long rolls from the bread shop, I load them with the chicken, spring onion, coriander (cilantro), chili and lettuce. Then just add a little drizzle of the sauce over the filling. A quick and easy alternative if you don’t feel like rice and want to add a bit more veg to the dish. I love drunken chicken but tend to use a whole chook. Eating off the bone is so much more satisfying! It does look tasty, and great idea to do small pieces as opposed to a whole chook and having to portion it up. Beautiful clean flavours. This is exactly the sort of dinner I look for midweek – delicious with next to no effort and maximum flavour. And I bet everyone in the house loves it. Quick and tasty is good for me too! This is definitely a great dish to get together on a Sunday afternoon for an easy dinner. I do love quick and tasty, and who wants to slave away on a Sunday! What an easy and tasty chicken dinner, great for those days when you do not want to labor in the kitchen. Thanks for sharing!! Glad you like it, and the less slaving away in the kitchen the better. Gorgeous soup recipe…I can’t believe how few ingredients it has. Can’t wait to give it a try. I love the combination of easy chicken with rice!! Perfect combination! Glad you like the recipe Ludmilla, and yep, love easy chicken dishes and do love my rice. This chicken dish sounds very easy and delicious! And many ingredients are required which is great! I’m a big fan of meals with minimal ingredients, life needs to be easy sometimes. That looks amazing, Sara. Thanks so much for sharing!! Love using Marsala in cooking, especially veal. I love how easy and fast this is! Chicken is so delicious when it’s marinated overnight! I agree, if you can plan ahead and marinade over night it is the best. Thanks so much Revathi for your lovely words about my photos. I’ve never heard of drunk chicken before, but I LOVE the idea. I’ll have to seek out some Chinese cooking wine!